Background: Myelin oligodendrocyte glycoprotein (MOG) is located on the external surface of myelin, a membranous component of the central nervous system (CNS) that forms the insulating lipid layer around neurons. The major MOG splicing variant (a1 transcript) encodes a transmembrane protein with an extracellular domain of an Ig variable (IgV) fold. MOG IgV domains from the same or different cells dimerize and contribute to the organization and maintenance of the myelin sheath in neurons. The encepalitogenic T cells recognize MOG and its immunodominant epitopes (epitopes 1-22, 35-55 and 92-106 located at the dimer interface) as foreign antigens and cause the destruction of myelin (demyelination) leading to the clinical condition known as multiple sclerosis (MS). 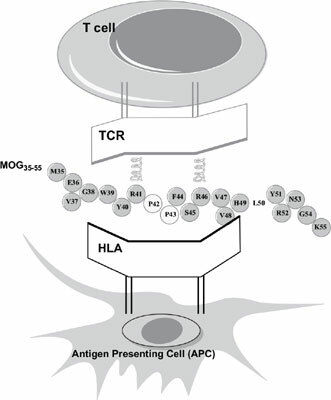 Recognition of the antigen takes place in the context of the trimolecular complex formed by HLA, MOGpeptides and TCR. Objective: Understanding the role of MOG in MS.
Method/Results: We have reviewed herein, the genomic organization of the human MOG gene, the structural characteristics of the MOG protein, the involvement of MOG in MS and clinical studies for the treatment of MS based on MOG peptide analogues. Conclusion: Conjugates of antigenic MOG peptides to mannan and combinations of antigenic MOG and other peptides chemically linked to cells of the immune system may modify the immune response, alleviating in some cases the symptoms of MS.
Central nervous system, cholesterol, immunodominant epitopes, multiple sclerosis, myelin oligodendrocyte glycoprotein, myelin.